The twenty-five foot XLR3F to Right-Angle XLR3M Balanced Interconnect Cable by Hosa Technology is designed to connect pro audio gear such as mixers, compressors and mic preamps with balanced XLR inputs and outputs. 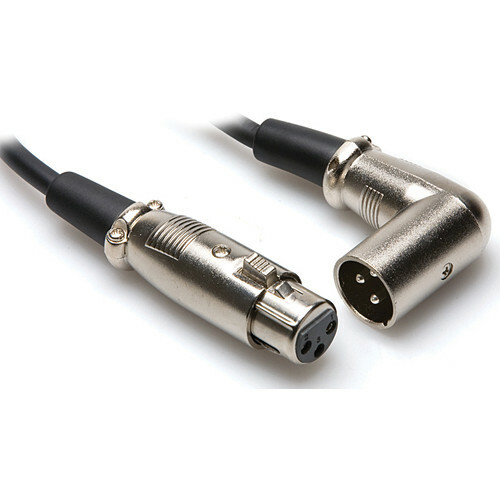 The right-angle XLR3M connector offers easy access to hard-to-reach XLR inputs. Its OFC (Oxygen-free Copper) conductors deliver enhanced signal clarity and the OFC spiral shielding provides flexibility plus electromagnetic and radio frequency interference rejection. This is an ideal cable for touring and other live-sound applications. Box Dimensions (LxWxH) 11.6 x 3.3 x 0.8"
XLR3F to Right-Angle XLR3M Balanced Interconnect Cable - 25' is rated 4.7 out of 5 by 3. Rated 5 out of 5 by SDArena from Very Helpful I'm a TV News Photographer and having this right angle helps a ton. Dangling cables can be a problem sometimes, especially in chaotic situations like press conferences and mass interviews. Every little bit helps. Rated 5 out of 5 by ERIC THE SCIENCE. from Works very well. I would buy another . For the price you cant go wrong.